seasoning and serving sauces for our most popular holiday roasts. The beef rib section has the best marbling, therefore it’s generally the tastiest and juiciest cut of beef. Standing Rib and Prime Rib is the same thing – both refer to the bone in rib. The Rib Eye is just the center, or eye of the rib. Without bones and the less tender ‘lifter’. At Tony’s we cut all our roasts as Rib Eyes, the only difference is whether or not they have the rib bone. When choosing a rib roast, insist on the highest grade possible. We offer USDA Prime (or True Prime Rib) as well as ‘High Choice’ or ‘Premium Choice’ beef – these are the top few percentile of quality beef ribs in the country. We also age our ribs for at least 28 days before cutting – extended aging increases taste and tenderness of high grade beef. This is the second most popular holiday roast. Deep in the loin, this muscle doesn’t have to work much, so it’s the most tender cut of beef. The tenderloin is also known as the filet mignon, or the small side of a T-bone steak. Unfortunately there are only about 6-8 pounds of tenderloin on a whole beef. 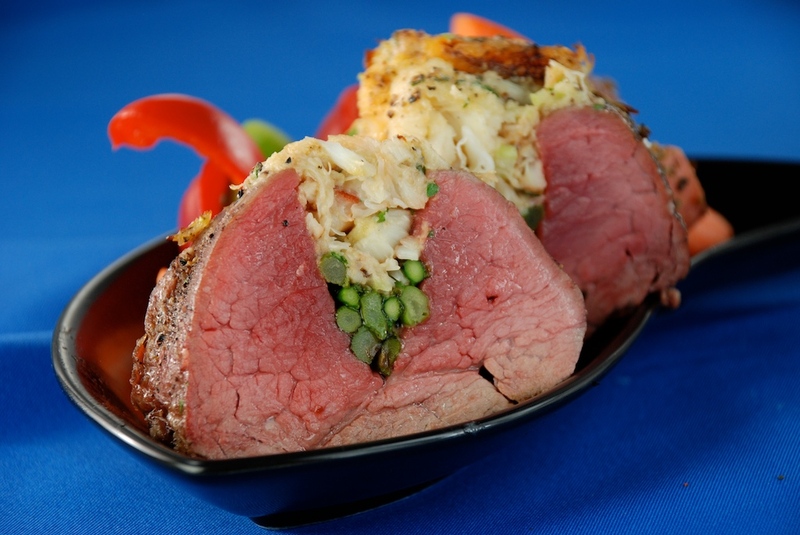 Tony’s Crab Stuffed Tenderloin – call ahead to order. When choosing tenderloins, make sure it is of High Choice or Prime Grade, and properly trimmed by a butcher – it’s encased in gristle and rather tricky to trim. We offer it single thickness, double thick and fatted, or as a center cut Chateaubriand. Cured and smoked legs of pork are very popular this time of year. When choosing a ham, I suggest buying only ‘Natural Juice’ or ‘Dry Cured’ Hams – these do not have added water weight. Hams of this quality are usually whole muscle and don’t have chunked and formed or ground meat added. We offer a variety of hams, some are smokier, some are boneless and all are delicious. In my opinion, the Berkshire (AKA Kurobuta) Ham is the finest ham on the market because of it’s amazing tenderness and mild flavor. Very popular at Christmas, these can be boneless, bone in, skin on or tied into a crown roast (a festive circular cut with Frenched rib bones). Because modern pork is so lean, I like to soak my pork roasts in one of our three seasoning brines before roasting or smoking. When choosing pork loin roast, look for all natural pork with a marbling level of at least 4% – exactly what we offer at Tony’s. For juicy and tender pork roast, roast to 145° internal and rest for 10-20 minutes before slicing. Lamb legs, rib racks and loin saddles are also very popular this time of year. Insist on local Rocky Mountain Lamb, it’s the best in the industry! We offer the highest grade of local lamb, and age it for 2 weeks to improve flavor and tenderness.